which takes advantage of the fact that UNION/EXCEPT/INTERSECT don’t honour the usual three-valued logic. 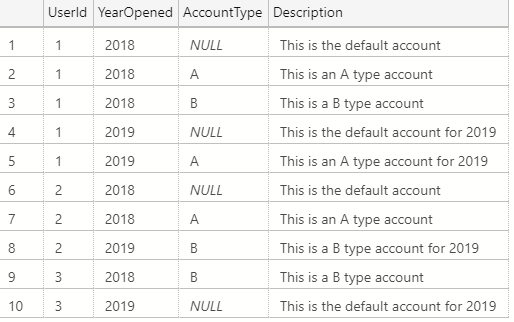 One disadvantage (other than the fact it may baffle those reading your code at first) is that if the YearOpened columns on the base tables are changed to allow NULLs, the INTERSECT code will start joining on NULLs in those columns, which you might not want and wouldn’t happen with the “a.YearOpened = at.YearOpened” code. Depending on the impact of such a thing happening, the join could be changed to use equality operators for all NOT NULL columns and INTERSECT for all NULL columns, which may or not look messy depending on how you like your code. 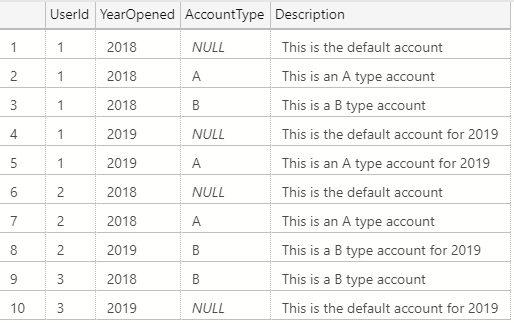 Being able to SCHEMABIND stored procedure code would be a nice way to protect your code from table changes like that, but I guess it’s just another argument in favour of regression testing and dependency tracking. Thanks for sharing (and clarifying the caveats). Thanks for the post! I’d been talking to somebody about the very issue the day before you posted.